Q. I'm looking for the full-text to this article. The easiest way to see if we have an article in full-text is to copy and paste the article title into the main search box on the MSU Libraries homepage. Your search results may show a PDF icon, or you may be directed to a PDF when you click the Find-It button, if we have full-text access. Some articles will only be available as HTML or as PDFs through Interlibrary Loan. Barbaresi, W., Colligan, R., Weaver, A., Voigt, R., Killian, J., & Katusic, S. (n.d). Mortality, ADHD, and Psychosocial Adversity in Adults With Childhood ADHD: A Prospective Study. Pediatrics, 131(4), 637-644. 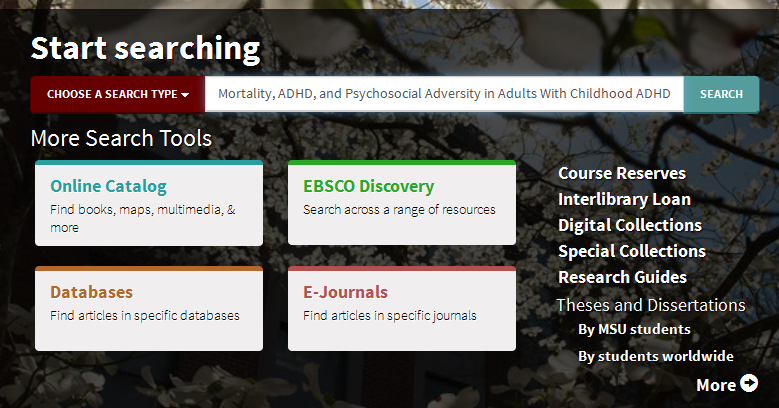 You would copy and paste the title “Mortality, ADHD, and Psychosocial Adversity in Adults With Childhood ADHD: A Prospective Study” into the Discovery search and press enter or search. This will simultaneously search many of our databases at the same time to see if we have full-text to that article. 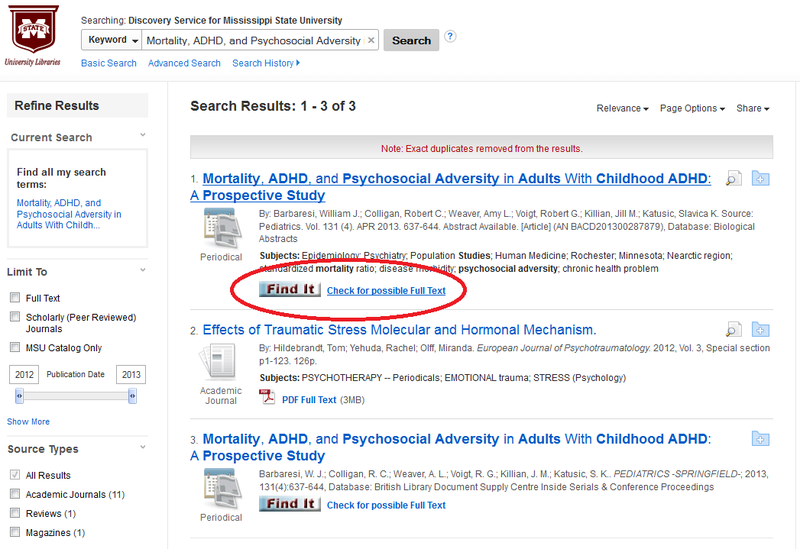 In your search results, you can click on the Find It button to get linked to the article full-text. If we don’t have the article in full-text, the Find it button will take you to a page that will check if we have the article in print, or if you'll need to borrow it through Interlibrary Loan. For more information on this process, please contact us at Ask A Librarian.